Fans fell in love with the warmth, wit, romance and fierce friendships in Flirty Dancing, Love Bomb, Sunkissed and Star Struck. 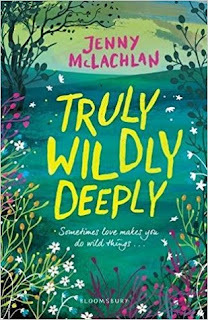 Jenny McLachlan writes the best kind of real-life fiction – with big themes and characters you'll love, her books go straight to your heart. I adore this book. I loved every single page and I just wanted to keep reading it to the exclusion of every else and I am left wanting a sequel. Or a series of sequels. 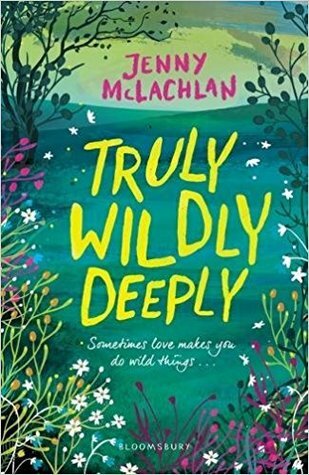 Truly Wildly Deeply is the story of Annie and Fab and I just loved their story from the first page. Annie is a teenage girl who has just started college. For Annie is this the first taste of freedom for her as she has to commute alone and make new friends at a college where she doesn't know anyone. The anticipation and excitment of this new beginning was evident from the start and it was brilliant going through that with her. Annie has cerebral palsy. While she doesn't see herself as disabled and is keen to just get on with it and do her awesome thing, it was really interesting to see how people treated her differently once they saw her crutches or her wheelchair. I was so pleased that this novel had a young disabled character as the lead showing that people with condition like Annie are far more than their disability. Fab. Oh Fab. Fab is a Polish, over enthused, over the top and excitable kind giant of a teenager. His enthusiasm for life just leaps off the page and I loved every scene with him in often for the sheer randomness of what he might do next especially once he meets Annie and tries to persuade her to go out with him. I love seeing their friendship grow over the course of the book. Another thing I loved about the book is the positive female relationship portrayed between Annie and her new found best friend Hilary. I loved that the book showed how important it was to Annie and how the girls supported each other. I love this book. If you haven't read it yet you desperately need to find a copy so you can meet Annie and Fab.